Super place for a rice bowl or BBQ Korean style lunch. This restaurant is in a strip mall off Highway 54 and is right next to a Korean supermarket. The menu is focused heavily on hot pot- a large soup with noodles, a variety of meats, tofu and vegetables. All the entrees come with a selection of pickled sides such as kimchi, pickled vegetables and very spicy sauces made with chilies and garlic. 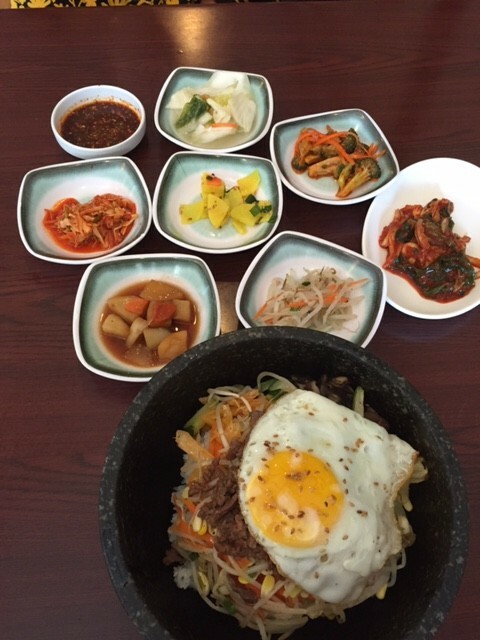 I love their Bibimbop which is essentially a rice bowl with meat or tofu, shredded vegetables and a fried egg on top. Then you add all your pickled condiments and sauce and its delicious. There have a lunch special menu that is primarily a number of bento boxes with BBQ, salad, and a dumpling. All boxes are about $12. Fun for a quick lunch or casual dinner spot.